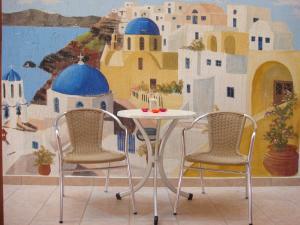 Pension Petros is located in the lively city of Fira, in Santorini, a few meters from the main square. It has simple and cozy rooms with air conditioning, fridge and balcony. Room with balcony and private bathroom. Larger room with a balcony and a private bathroom. This double room is located in a semi-basement and has air conditioning.